I hate weeks like this. I’m sitting here, Friday at midnight, trying to think of something to write about. My deadline is Saturday at noon, so I have a little time. But with so many topics to choose from, how can anyone be expected to pick just one? August used to be a traditionally slow time in politics – the month of Congressional recess and vacations when cable news tries out D-listers and new hopefuls desperately seeking fame and human-interest stories become all the rage. It’s still those things, mostly, but in 2018 there is never a dull moment, even when you want one. This week saw a special election in Ohio that never should have been anything more than a footnote on a random Tuesday that was transformed into the most important election ever, or at least since the last most important election ever. Democrats, both in and out of the media, did what they always do – they assigned the weight of the world, and their personal hopes and dreams, to the results. Of course, just like 2016, leftists were sure they knew the outcome. 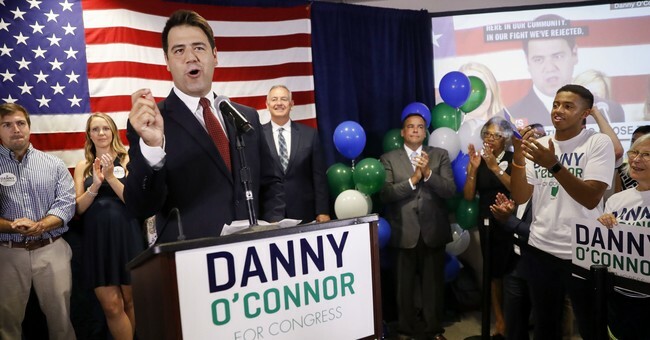 The Democrat was going to win, fairly easily for a Democrat in that district, and that victory was going to serve as a chance to inspire their base to the polls come November. The voters of Ohio’s 12th district had other ideas. Democrats did what too many in politics do – the spiked the ball on the 5-yard-line. Republican Troy Balderson won, in a squeaker. But as my father told me when I was a kid, it doesn’t matter if you win by one or one million, it’s still a win. Democrats will try to steal the election, as they always to with close elections. Still, watching the air drain from liberal’s bubbles as the returns showed, once again, their plans had been thwarted by voters is one of life’s simpler pleasures. Just as knowing socialism lost this week brought me a smile. The golden girl of MSNBC and CNN saw her and the Senate’s angry grandpa’s candidates lost, some by quite a lot, in their primaries. Alexandria Ocasio-Cortez, whose name you must pronounce like you’re a cheesy local news anchor trying to sound culturally sensitive while speaking a Hispanic name or else it’s a hate crime, and Bernie Sanders could not share their socialist magic with fellow traveler seeking Democratic nominations. It’s a shame, really, as the more leftists who speak of their policy ideas, especially those with the “wisdom” of Alexandria in interviews, the more ammunition Republicans have against all Democrats this fall. It’s why, while liberals seek to silence conservative voices, conservatives want to put a megaphone to leftists’ mouths so everyone can hear their craziness. She’ll likely win her election in November, her district is that liberal (if she ever actually spends any time there since she’s busy basking in her celebrity status and traveling around the country giving the kiss of death to other “progressives” in their primaries), but she will serve as an anchor to other Democrats who will have to answer for her anti-liberty and anti-American proposals, not to mention her inability to do math. So please, Alexandria, by all means, keep talking. Also this week the “Russian collusion” investigatory scam rolled on, with the trial of Paul Manafort for unrelated tax and banking charges. What he’s charged with happened long before he’d met Donald Trump and would send a mortal to prison for about a year, but because he did meet Trump, Manafort now faces spending the rest of his life plus another couple hundred years in prison, 305 in total, for hiding taxable income and lying on a loan application. John Hinckley, who show President Ronald Reagan and seriously wounded three others in an assassination attempt in 1981, is now a free man but Manafort may be sent to prison until the year 2323. Ain’t justice grand? Still, even if convicted, what Manafort is charged with has nothing to do with Trump or Russia, so it couldn’t really be used by liberals in any honest way (not that that will stop them from trying). As you can see, it’s tough to decide what to write about. How can anyone pick just one thing? I’m sure somebody could, but I can’t. So I didn’t. Of course, I could have just written about the interview I conducted with Gregg Jarrett about his new book, “The Russia Hoax,” on my new(ish) podcast, which you should watch or listen (and subscribe) to because it’s really good, but that would have been too easy. Maybe next week when the news cycle slows down a little. Then again, it is 2018, so probably not. PS: Once (yet) again, I want to encourage you to order a copy of my book, “Outrage, INC: How the Liberal Mob Ruined Science, Journalism, and Hollywood.” It explains the why and how of what the left does in ways that haven’t been before, and it does so with a lot of humor. Don’t take my word for it, take the words of Mark Levin, Ann Coulter, David Limbaugh, Dana Loesch, Dan Bongino, Michelle Malkin, Ben Shapiro, Kurt Schlichter, and countless others. Obviously, I have an interest in selling you a copy of the book, but they don’t. Yet they’ve all endorsed it. And, for reasons I don’t understand but am eternally grateful for, people are still buying it. You’ll love it, trust me. Thanks.